Candy City? Sweet! I bet a bunch of suckers live there. Don’t let the Candy Door hit your Candy … on the way out! This sounds suspiciously like metaphorical criticism of America’s foreign policy. Did the communist “Daily Worker” have a funnies page? Ok, now we know the truth. 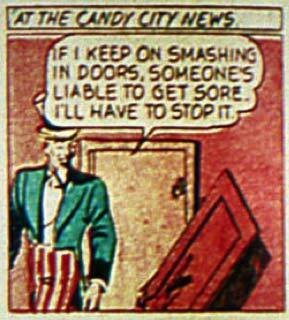 He’s not that strong, that door’s made of candy. It’s just like those sugar “beer” bottles they use on TV and in the movies for smashing over someone’s head in bar fights. He’s really afraid the next door he tries smashing will be real and he’ll break his wrist on it.